Experimentally resolved structures of proteins, RNA, and DNA, derived from the Protein Data Bank (PDB), with value-added features such as explicit chemical graphs, computationally identified 3D domains (compact substructures) that are used to identify similar 3D structures, as well as links to literature, similar sequences, information about chemicals bound to the structures, and more. 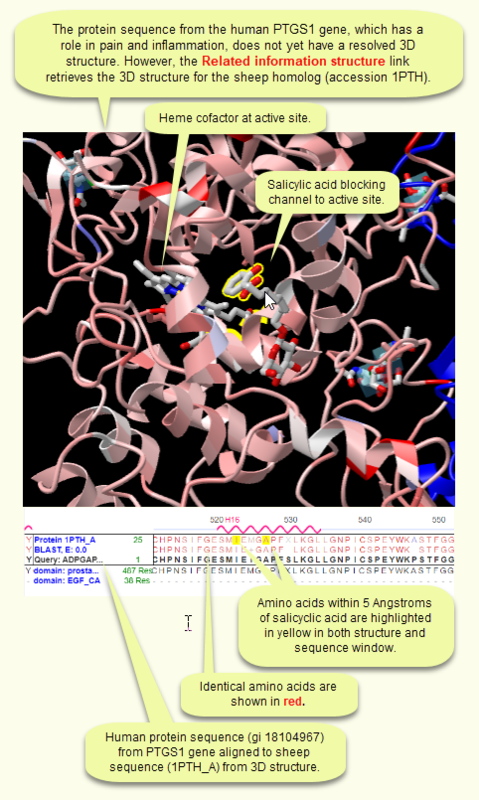 These connections make it possible, for example, to find 3D structures for homologs of a protein sequence of interest, then interactively view the sequence-structure relationships, active sites, bound chemicals, journal articles, and more. A new WebGL-based viewer for interactive viewing of three-dimensional macromolecular structures on the web, without the need to install a separate application, and enables you to (1) interactively view 3D structures and corresponding sequence data; (2) interactively view superpositions of similar structures; (3) cutomize the display of a structure and generate a URL that allows you to share the link; (4) incorporate iCn3D into your own pages. An example of each is accessible from the "About iCn3D" page. A tool for visualization of three-dimensional structures, available for Mac and PC, with emphasis on interactive examination of sequence-structure relationships and superposition of geometrically similar structures. Cn3D can be used to display MMDB structures, superpositions of VAST similar structures, and conserved core motifs identified in conserved domains. A tool that compares a query protein sequence against all protein sequences from experimentally resolved 3D structures, by using protein BLAST against the PDB data set. The purpose is to find representative 3D structures for the query and/or its homologs, as available. This has been done for each sequence record in the Entrez Protein database and the pre-computed search results are available as "Related Structures" links in the "Related Information" menu of in the right margin of protein sequence record displays (illustrated example). You can also input a protein query sequence directly (in the form of a GI number) into the Related Structures search page in order to find sequence-similar 3D structure records. The search results can be viewed in Cn3D, which displays an alignment of the query protein to the related structure's sequence (illustrated example) and allows you to interactively examine the sequence-structure relationship. Because the Related Structures service uses BLAST to find related structures, and Cn3D to display them, it is also referred to as "CBLAST." A computer algorithm developed at NCBI and used to identify similar protein 3-dimensional structures by purely geometric criteria, and to identify distant homologs that cannot be recognized by sequence comparison. "Similar structures" for every structure in MMDB are pre-computed using VAST and accessible via links on the MMDB Structure Summary pages. The VAST Search web service also allows you to compare the coordinates of a newly resolved structure in PDB file format against all structures in MMDB to find its neighbors. A tool designed to identify macromolecules that have similar 3-dimensional structures, with an emphasis on finding those with similar biological assemblies ("biological units" or "biounits"). The similarities are calculated using purely geometric criteria, and therefore can identify distant homologs that cannot be recognized by sequence comparison. VAST+ is built upon the original Vector Alignment Search Tool (VAST), and expands the capabilities of that program by making it possible to now find macromolecular structures that have similarly shaped biological units, not just those that share similarly shaped individual protein molecules or fragments. The "How To" page provides tips for searching by molecule type, gene/protein product, and more. You can also retrieve any search set above and then add terms of interest to the query box. For example, try this: (a) follow the link for "Protein + Chemical"; (b) insert AND neurofibromin in the query box at the top of the search results page; and (c) press "Go" to retrieve neurofibromin protein structures bound to a chemical.